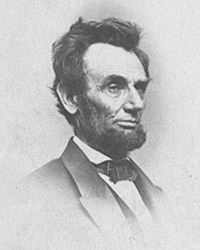 When President-elect Lincoln departed Springfield, Illinois for Washington on February 11, 1861, he began his short farewell address by saying: “My friends. No one not in my position can appreciate the sadness I feel at this parting. To this people I owe all that I am. Here I have lived more than a quarter of a century; here my children were born, and here one of them lies buried. I now leave, not knowing when or whether every I may return….”2 It was almost exactly one year after a group of Mr. Lincoln’s legal and political friends had gathered at the State Capitol and plotted his candidacy. Michael Burlingame, editor, An Oral History of Abraham Lincoln, John G. Nicolay’s Interviews and Essays, p. 99. Roy P. Basler, editor, The Collected Works of Abraham Lincoln, Volume IV, p. 190 (February 11, 1861). Nathan William MacChesney, editor, Shelby M. Cullom, Abraham Lincoln: The Tribute of a Century, 1808-1909, “Lincoln and His Relations with Congress”, p. 501-502. Rufus Rockwell Wilson, editor, Lincoln Among His Friends: A Sheaf of Intimate Memories, p. 266 (Thomas D. Jones, Sacramento Weekly Union, November 4, 1871). William H. Herndon and Jesse W. Weik, Herndon’s Life of Abraham Lincoln, p. 390-391. Henry Villard, Lincoln on the Eve of ‘61, p. 64. Roy P. Basler, editor, The Collected Works of Abraham Lincoln, Volume IV, p. 211 (February 15, 1861). Carl Sandburg, Abraham Lincoln: The War Years, Volume IV, p. 51. John W. Forney, Anecdotes of Public Men, p. 167. Ward Hill Lamon, Recollections of Abraham Lincoln, p. 97-98. Rufus Rockwell Wilson, editor, Intimate Memories of Lincoln, p. 98 (Thomas W. S. Kidd, speech to the Bar Association of Sangamon County, Illinois, April 25, 1903). Isaac N. Arnold, The Life of Abraham Lincoln, p. 240. Thomas F. Pendel, Thirty-Six Years in the White House, p. 22. Carl Sandburg, Abraham Lincoln: The War Years, Volume II, p. 227. Carl Sandburg, Abraham Lincoln: The War Years, Volume II, p. 406. Rufus Rockwell Wilson, editor, Intimate Memories of Lincoln, p. 131-132 (Thomas Lewis).